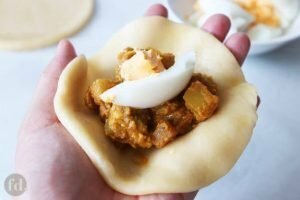 Deep-fried curry puffs – crispy, flaky, crumbly, and buttery shortcrust pastries stuffed with curried chicken chunks, potatoes and egg – are traditional street snacks that are sure to pack a delicious punch! Follow my step-by-step pictorial on how to make freshly fried puffs easily and confidently! I have to confess that I’ve been on a curry puff craze lately. 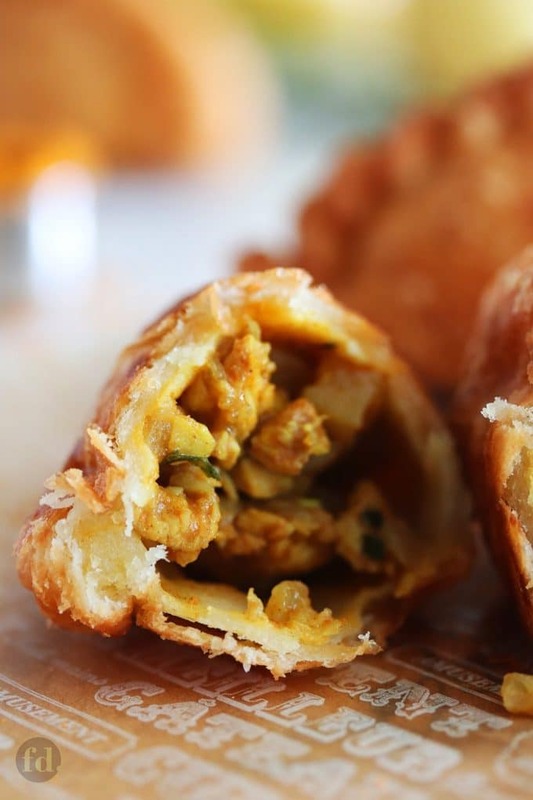 Anyone who’s ever eaten a curry puff will know that these deep-fried stuffed pastries always hit the spot once you bite into that crispy, crumbly, buttery crust, and that delicious, savoury stuffing inside. I hardly ever stop at one, and I particularly enjoy eating generously sized puffs like the ones I’ll be showing you how to make here. 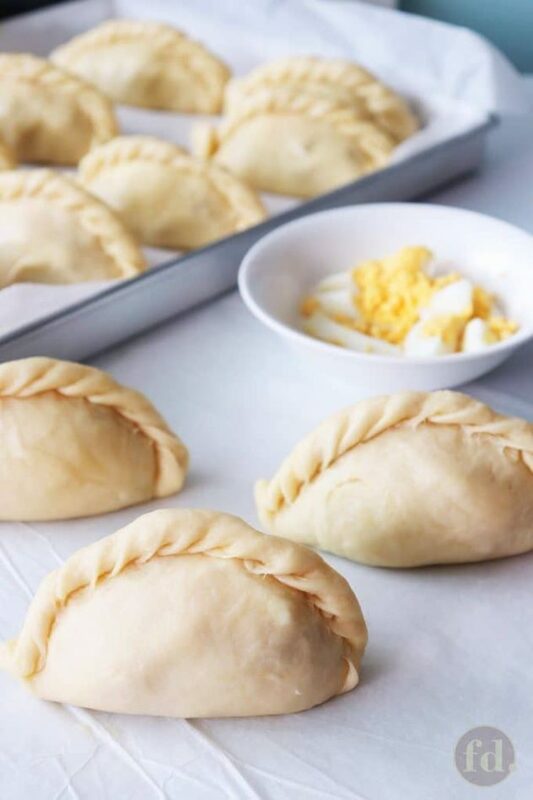 Have you always felt daunted, even somewhat intimidated by the prospect of making curry puffs from scratch? If you do, then this post is for home cooks like you (and me!). It does take a little bit of work and time (then again, making anything yummylicious always does, don’t you agree?) 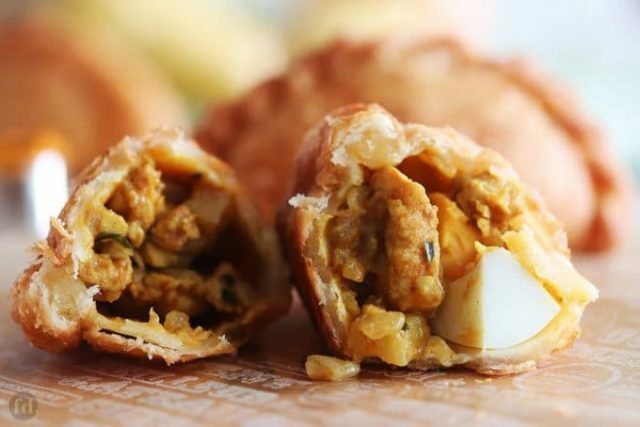 but you’ll find it’s so satisfying when you finally bite into a deep-fried curry puff of your own creation! And I’ll be showing you here step-by-step how to to make these delicious puffs. I’ll also be punctuating my post with tips and suggestions from my recipe testing, I picked up along the way, so you can hit the ground running. 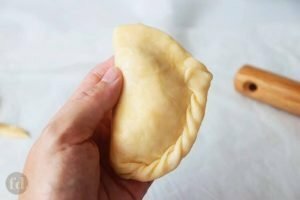 Before making this home version of curry puffs, I had always satisfied my cravings with the ones sold by Old Chang Kee as well as 1A Crispy Puffs outlets. If you happen to like the Old Change Kee variety, you’ll know that their puffs use a shortcrust type of pastry. When deep-fried, these puffs are deliciously crispy, crumbly and doughy, and oooh yeah… buttery… just my kind of love. Then there are the spiral puffs, the type exemplified by 1A Crispy Puffs in their signature crispy puff, and others like it, which is a fried puff pastry variety. 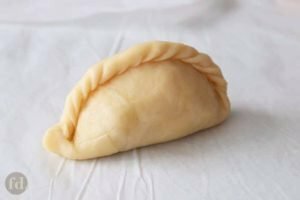 Typically, these are made with two types of pastry dough, a water-based dough made in it’s simplest form from flour and water, and an oil-based dough, usually made from flour and fat such as margarine, butter, ghee, lard or shortening. 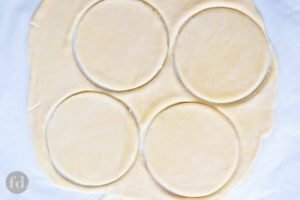 The oil dough is wrapped inside the water dough, then rolled and folded repetitively in much the same way as with Western style puff pastry, thereby creating many alternating layers or spirals. These pastry layers are tissue-thin, buttery, light and flaky, and literally melts in your mouth. Seriously, how can you not get hooked on THAT? Here, I’m sharing a recipe for the shortcrust variety, just because this happens to be my favourite kind! In my humble opinion, it’s pretty dang good!! This has gone through tweaks and many, many tries, and I’m super excited at how far I’ve come with this recipe! I’d like to say that this is my best ever version yet, but you all know, the perfectionist in me will be working hard already to improve this recipe even further. For now, I think you’ll find this version truly worth your while! This recipe will give you beautiful golden brown puffs when deep fried at the right temperature (see Tip #11 below). 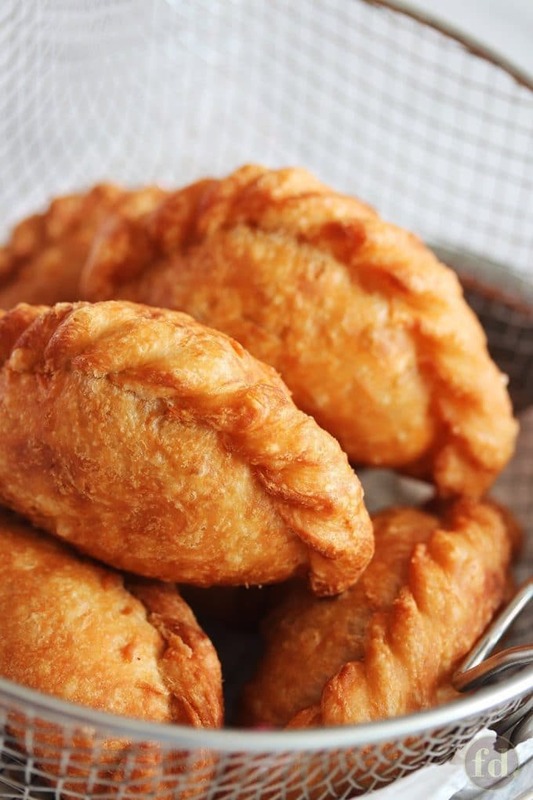 The crust of the puff is crispy, flaky, crumbly, with the buttery flavours coming through subtly, but distinctly, without tasting overly rich or greasy. When you get past the pastry crust, you’ll bite into a tender, doughy pastry crumb just as you get your first taste of the curried chicken and potato stuffing. If you’re strapped for time, you can do everything ahead of time. That goes for the curried chicken and potato filling, as well as the pastry dough. You can even fill and shape the puffs, and freeze these ready-made puffs for later frying. Do take a moment to read the recipe notes I’ve left to the end of the recipe instructions on how to store, chill and/or freeze for later, as well as how to re-heat leftovers. So, are you feeling excited to get going? Great, ‘cos I am too! First, we start out by cooking the filling so that it has time to cool completely by the time you’re ready to fill and shape the puffs. 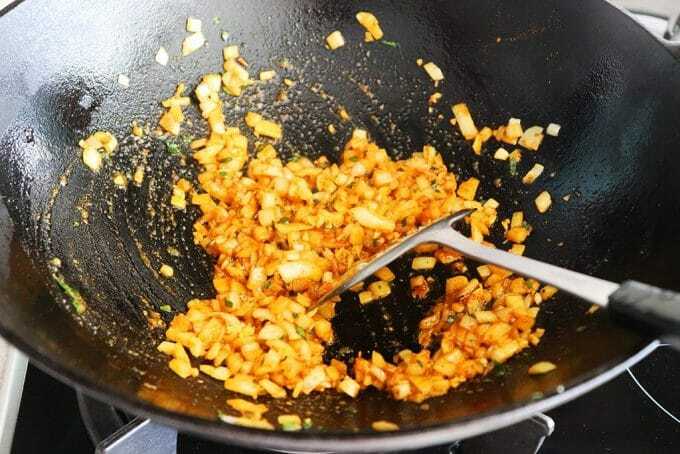 In a hot wok with some oil, fry finely chopped onion till softened, then add chopped garlic, curry leaves (optional) and curry powder, stir fry till aromatic. 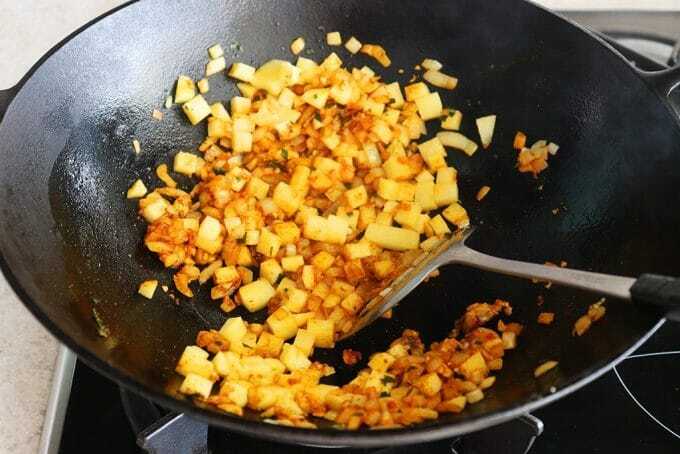 Put in diced potatoes, fry for a minute to mix well, then add water, and simmer until potatoes are just softened. Tip #1 : Slice or dice chicken and potato into regular-shaped cubes no bigger than 1-cm. It will be easier to fill and seal, and to shape uniformly. But you CAN have it chunky, if you like your filling with extra bite! Tip #2 (optional): If you like your filling a little mushy, as I do, or not too dry, once the potatoes are softened, and before adding the meat, mash half of them with a fork or potato masher. The semi-mashed potatoes will hold the chicken chunks together, making the filling more moist and compact. Next, add the diced chicken, and continue to stir fry until meat is cooked. Let the filling cook until it becomes dry. Flavour with sugar and salt. Scoop out and set aside to cool completely. At this point, we’ll need to hard-boil the eggs, peel them and slice each into 6 wedges. Stir fry chopped onions until softened. 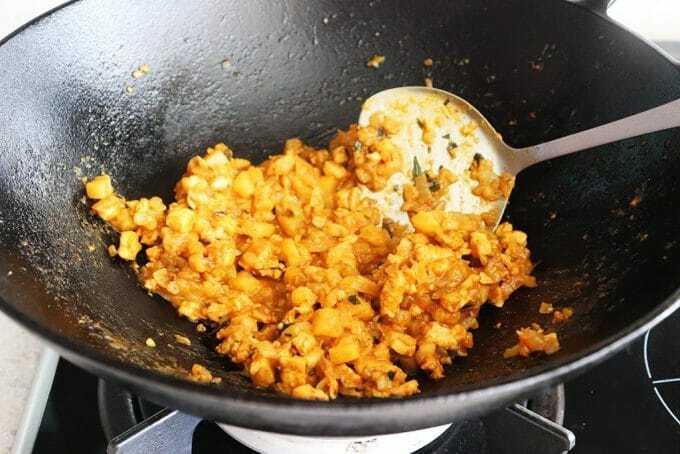 Add chopped garlic, curry leaves and curry powder. Add potatoes, stir fry for 1 min to mix well. Add water, bring to simmer and cook potatoes until softened. Add chicken and stir fry until cooked through. Season with sugar and salt. Fry until mixture becomes dry. 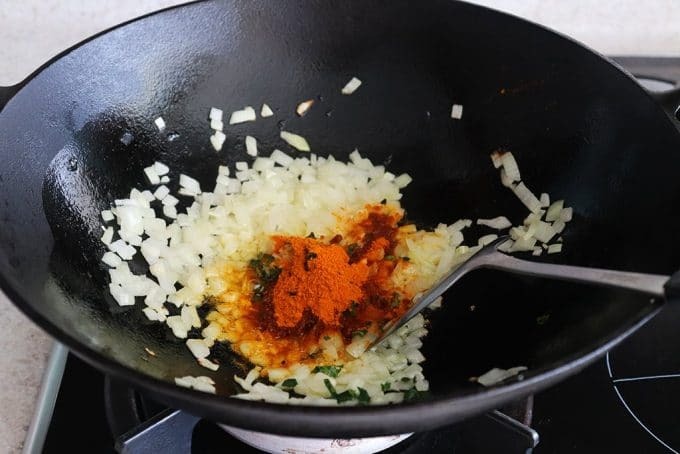 Tip #3: Do note that for the curry spices, chicken and potato flavours to marry well and come through, it should be seasoned with enough salt to accentuate the flavours. Sugar helps to blunt any bitterness in the curry spices, and balance flavours. Obviously, you add only as much salt or sugar as is comfortable, to your taste. Next, we prepare the pastry dough. Combine the pastry dough ingredients in a mixing bowl, rub in gently with your fingers until the mixture resembles fine breadcrumbs. 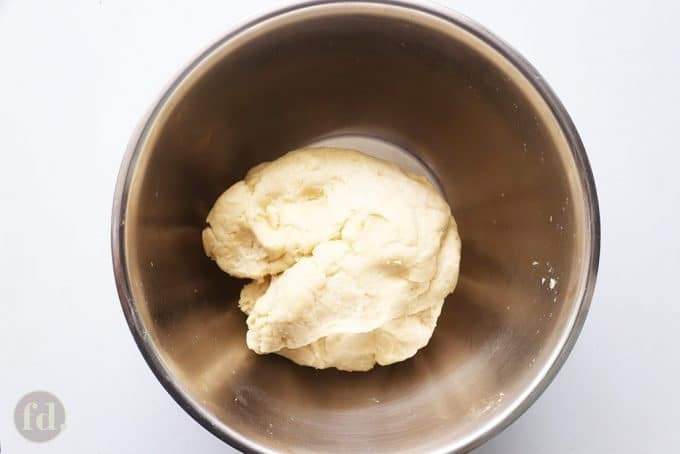 Then add the water-egg mixture, mix in with fingers just long enough till you get a fairly smooth dough, and the sides of the bowl have come clean. Cover with a clean, damp cloth or cling wrap, and let it chill for 30 minutes. 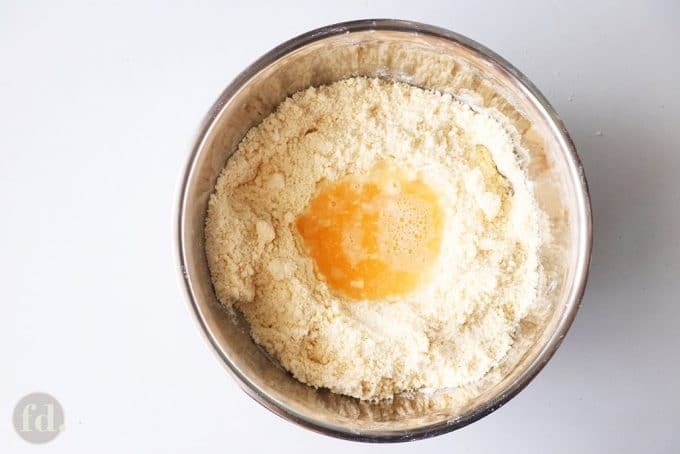 Tip #4: To ensure a tender pastry crumb, mix just enough with your fingers, to get a fairly smooth dough, picking up the loose flour until the sides of the bowl come clean. Do NOT knead or over-work the dough. 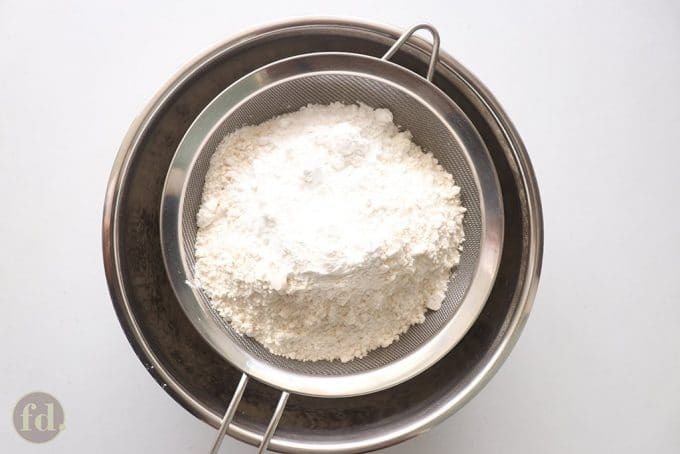 Sift flours and baking powder together into a large mixing bowl. Add shortening and grate cold butter over the flour mixture. Rub with fingers until it resembles fine breadcrumbs. Mix in with fingers until dough forms, and the sides of the bowl come clean. Let the dough rest, covered, and chill for 30 minutes. Tip #5: Grate cold butter (right out of the chiller) into the flour mixture with a vegetable peeler. It will incorporate more quickly and evenly, and keep the dough temperature cool. Tip #6: Keep unused pastry dough, as well as filled pastries as cold as possible by chilling in the refrigerator as you make these. This is to prevent the butter from melting into the flour, so that it can instantly make steam when it comes into contact with hot oil during the frying process, which makes for a light and flaky crumb. Now, we’re ready for the fun part! Have everything ready on your counter – extra flour for dusting (if you need it), cooled curry filling, and sliced egg wedges. 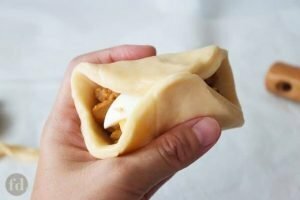 Prepare a pan or tray lined with baking paper – you’ll be placing your ready-made curry puffs here, so you can easily place this tray in the chiller or freezer. Divide dough in half, keep one half chilled until ready to use. Roll out dough between two sheets of baking paper to 3-mm thickness. For roughly fist-sized puffs, cut into 11-cm (4.5-inch) rounds, or for smaller puffs, cut into 9-cm (3.5-inch) rounds using a cookie cutter. Tip #7: If you don’t have the right-sized cookie cutter, you can improvise using empty (but clean!) cans, or with plastic/metallic caps of jars or containers, to cut into the pastry. Alternatively, the pastry can be rolled into a long sausage, and cut or divided into 9 -10 (large) /12 (smaller) equal portions. Round each into a ball, then roll out into rounds. Divide dough in half. Roll out one half. Roll out evenly to 3-mm thickness. Spoon 1 heaped tbsp of filling onto the centre, and top with an egg wedge (if making smaller puffs, spoon about 2 heaped tsp of filling). Enclose the filling, press to seal the edges. OH YES, VERY IMPORTANT! Keep a clean, damp cloth nearby to clean off any curry stains on your fingers, when handling the pastry dough. 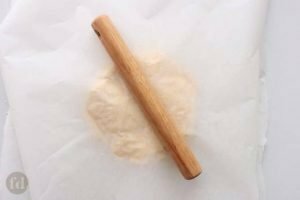 To flute the puff, start at the end nearest to you, use the tips of your thumb and index finger to flip a small width of the pastry edge over on itself, and pinch down onto the dough to ‘glue’ it in place. This will create a pointed tip at the plain edge (see photos below). You then flip over a finger width of this pointed edge over, and pinch down. Work along the edge, keeping the angle and width of each flute consistent, until you reach the other end. Creating the fluted edge gets better with practice, so don’t worry if your puffs aren’t looking as nice as you’d like (I’m sorry I couldn’t get this on video, hopefully in my next update!). Alternatively, you can use a fork and press lightly into the sealed edges. Tip #8: If the cut rounds shrink a fair bit, you can roll over lightly, but keep the shape round or slightly oval. Tip #9: I find that an optimal thickness for the pastry shell is 0.3 mm, for a crispy, crumbly crust. If the pastry is rolled too thin, it may also be prone to tearing when you try to fill or shape the puff. If that happens, simply tear a bit of leftover dough (dough left over after cutting out the rounds) and patch the tear. If you enjoy thicker pastry crusts, be sure to fry long enough at the optimal temperature to ensure the dough is cooked through (see Tip #11). Spoon filling onto the centre, top with an egg wedge. Bring the top and bottom halves of the pastry over the stuffing, pinch together to seal. Pinch to seal the edge. Flute the edges, starting from one end. Flute the entire length of the puff. Finish off the other end, by pressing the pastry ends together. Tip #10: When pressing and sealing the edges, do not press the edges too thin, and make sure you have at least 1-cm border all around. This will allow you enough pastry at the edges to create the fluted pattern. Gather the left over dough together into a ball, and re-roll as before, cut, fill, shape, seal, and flute. Repeat until all the pastry dough is used up. Meanwhile, keep the filled pastries as cold as possible, by placing the tray in the freezer or chiller, to prevent the butter from melting into the flour, while you prepare for frying. Now, get ready to fry the puffs! 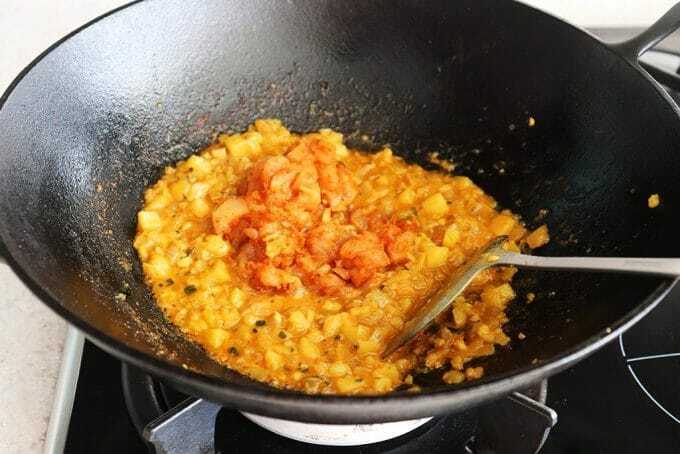 Over a medium fire, heat up a deep skillet, pot or wok filled with enough vegetable oil to submerge the puffs. When the oil reaches 170 to 175℃, preferably not exceeding 180℃, start with small batches, 3 puffs at a time. In this temperature range, the pastry should brown evenly to a lovely golden brown in 5 to 6 minutes. Tip #11: Frying is such an essential finishing step to getting golden brown, crispy, flaky puffs, but often under emphasised. I have found that an ideal oil temperature range for frying this pastry to ensure even and perfect browning is between 170℃ to 180℃. Fry in small batches, 3 to 4, to ensure the temperature stays in the optimal range. If the oil is too hot, the pastry may brown unevenly, cook too quickly or risk burning the surface before the dough layer inside has had enough time to cook through. If the oil is not hot enough, the pastry may absorb too much oil, and may become and taste overly greasy. Tip #12: CAUTION! 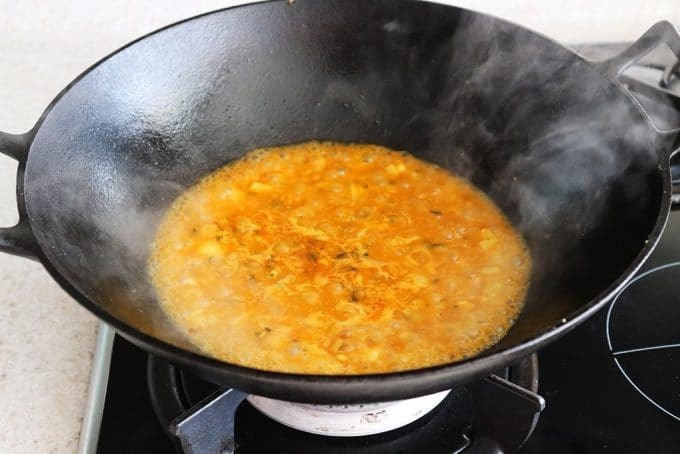 Hot oil may sometimes foam up during the frying process with subsequent batch frying, due possibly, to reaction between hot oil, water content and baking powder. Exercise caution by using deep frying pot, put puffs into the hot oil one at a time, allowing 15-20 seconds to lapse in between. This recipe should yield 9 to 10 large fist-sized puffs, or 12 smaller puffs, but feel free to create your own size. Of course, these are best eaten freshly fried while still warm, on the day they’re made, to enjoy them at their crispiest and flakiest! But leftovers can be made just as good if you store these wrapped individually in food grade paper, in an air-tight container or sealed Ziploc bag, and kept in the refrigerator. Just read my recipe notes below on how to re-heat leftovers in a toaster or oven to get them crisp and yummy-licious again! Now, enjoy!! Don’t forget to share your photos if you try these – simply tag #foodelicacy or @foodelicacy, so I can see your creations and drool away with you! ADD THIS RECIPE TO YOUR FAVOURITES! PIN IT NOW! 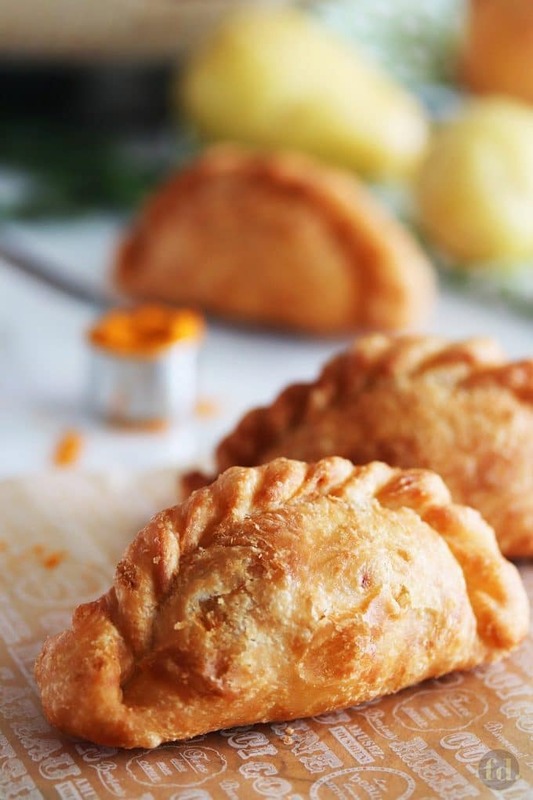 These deep-fried, fragrant curry puffs have a crispy, flaky, buttery crust, and are stuffed with curried chicken, potatoes and cooked egg, making these delicious finger food, tea time treats, and snacks to satisfy any craving! Dice chicken meat and potatoes into 1-cm cubes. Season chicken with 1/2 tbsp of the curry powder and 1/4 tsp of the salt. Finely chop onions, garlic and curry leaves. Meanwhile, slice hard-boiled eggs into 6 wedges each. 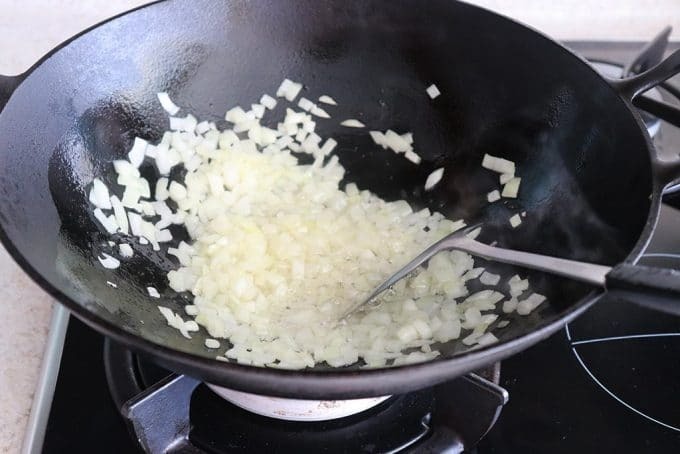 Heat up 3 tbsp oil in a wok or skillet over medium heat. When hot, fry onion until softened. Add chopped garlic, curry leaves, and remaining 1 1/2 tbsp curry powder, and continue to stir fry until fragrant. Add potatoes, fry for 1 min to mix well. Pour in water, and let simmer until potatoes are almost soft, and mixture is almost dry. 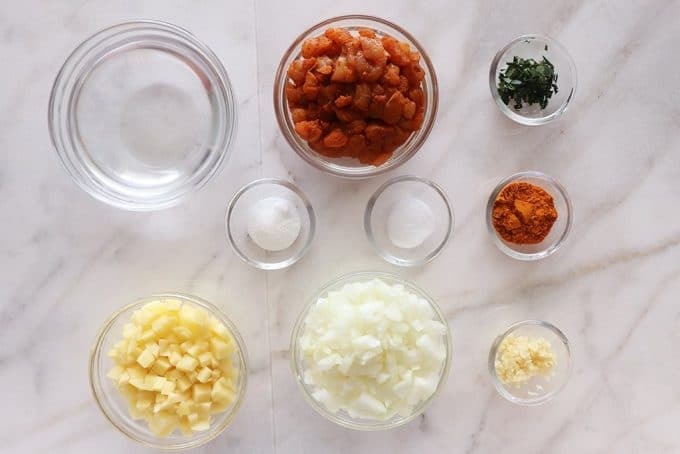 If the mixture gets dry before potatoes are soft enough, add 1 to 2 tbsp water to prevent drying out, as and when needed. Add chicken, continue to stir fry until cooked. Season with remaining 1/4 plus 1/8 tsp of salt, and 1 tsp sugar, or to taste (note: the curry stuffing will be more flavourful if it is just a little saltish, but suited to your taste). Once mixture is dry, dish out and allow to cool completely. Sift plain flour, rice flour, corn flour and baking powder into a large mixing bowl. Grate (or dice) cold butter over the flour mixture. Add shortening. Using your fingers, gently rub into the flour mixture, until it becomes sandy and resembles fine breadcrumbs. Dissolve salt and sugar in water. Add egg yolk and stir till well mixed. Make a well in the centre of the flour mixture, pour in the water mixture. 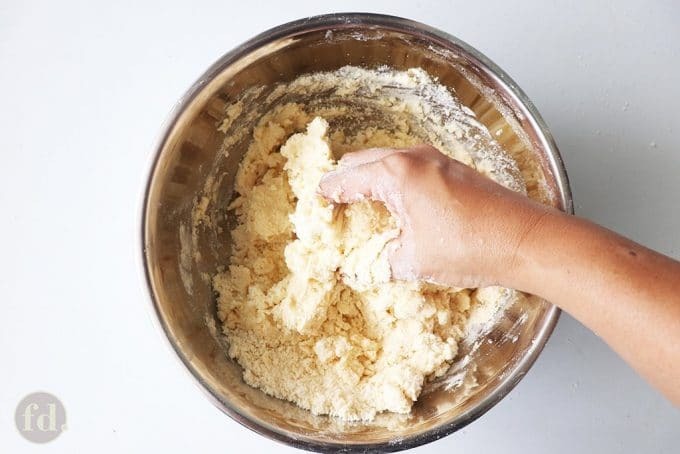 Mix in with your fingers until the dough comes together (it will be quite sticky at first), picking up all the loose flour until the sides of the bowl comes clean. 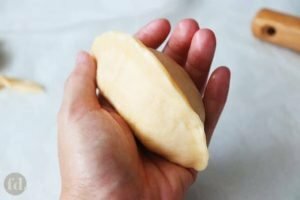 Do NOT knead or overwork the dough. 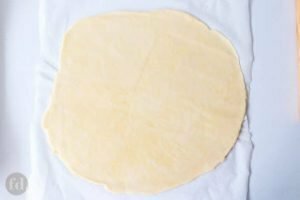 Cover dough with a damp tea cloth. Let dough rest and chill in the refrigerator for 30 minutes. It should be cool but soft enough for handling. Meanwhile, line a large baking tray with baking paper. Cut dough into half. Keep one half covered and return to the chiller. Roll out dough half between two sheets of baking paper to 3-mm thickness. Cut out 11-cm/4.5-inch rounds for large puffs (or 9-cm/3.5-inch rounds for smaller puffs). Place an egg wedge in the centre (if using), and spoon 1 heaped tbsp of stuffing (or 2 heaped tsps for smaller puffs) over the egg. Enclose the filling by bringing the top and bottom halves of the pastry over the stuffing to meet in the centre. Seal by pressing and fluting the edges. Space puffs slightly apart on prepared tray. 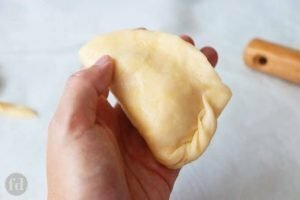 Gather remaining pastry dough into a ball and re-roll, cut, fill, seal and flute. Repeat with the other dough half, until all pastry is used up. Once done, place the tray with the puffs in the chiller, while you prepare and heat up the oil for frying. 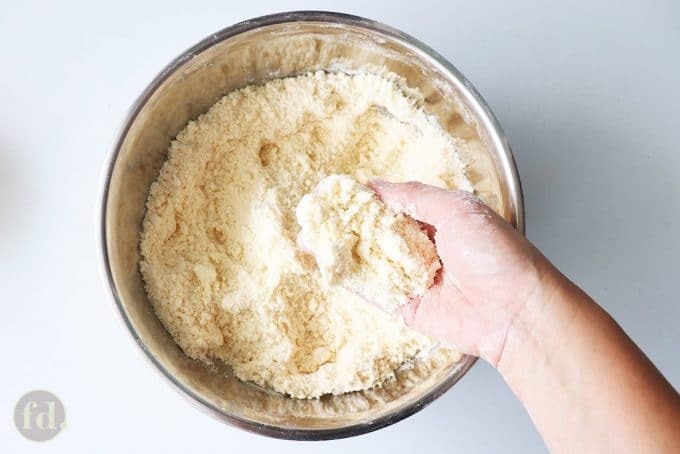 Tip #4: To ensure a tender pastry crumb, mix just enough with your fingers, to get a fairly smooth dough, picking up the loose flour until the sides of the bowl come clean. Do NOT knead. Tip #7: If you don't have the right-sized cookie cutter, you can improvise using empty (but clean!) cans, or with plastic/metallic caps of jars or containers, to cut into the pastry. Alternatively, the pastry can be rolled into a long sausage, and cut or divided into 6 (large) /8 (smaller) equal portions. Round each into a ball, then roll out into rounds. #1. Fried curry puffs should be allowed to cool to room temperature before storing. Always store in sealed, air-tight containers. Keep chilled in the refrigerator for 2 to 3 days. #2. To reheat, heat up an oven to 175°C (or use 'warm' setting on your oven if available), and place puffs on a heat-proof pan or plate. Heat for 10 to 12 mins, or until the pastry crisps up. To avoid over-browning the puffs, you can place a sheet of aluminium foil over the puffs. If using a counter-top toaster oven, depending on your toaster settings, re-heat for 8 to 10 mins, covered with aluminium foil. Remove from toaster or oven, and let stand for 5 minutes to allow pastry to crisp up. #1. 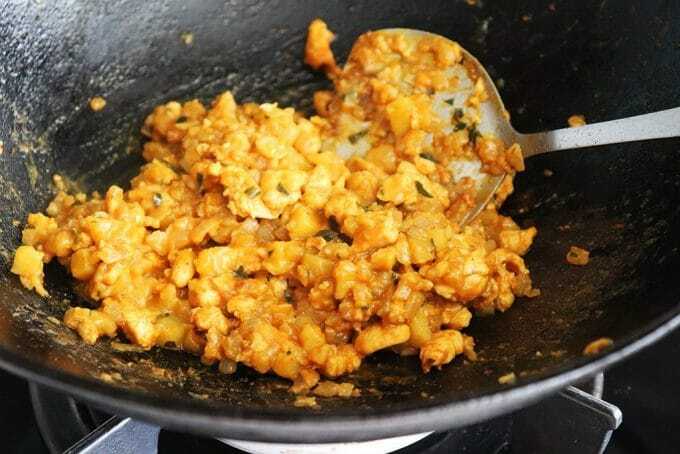 The curry filling can be cooked in advance and kept chilled for up to 5 days, or frozen for up to a month. Chill extra or left-over filling in air-tight glass containers (curry tends to stain plastic containers), or store in well-sealed freezer bags if storing in the freezer. Thaw in the fridge a day ahead of when you intend to use it. #2. The pastry dough can be made in advance and stored in well-sealed bags. Wrap the pastry dough tightly with two layers of cling wrap, keep in a well-sealed freezer bag, and store in the refrigerator for up to 5 days. On the day you intend to make the puffs, remove from the refrigerator and allow it to soften at room temperature, in the bag. You only need it to be soft enough, but still cool, to handle easily for rolling, cutting, shaping, etc. #3. 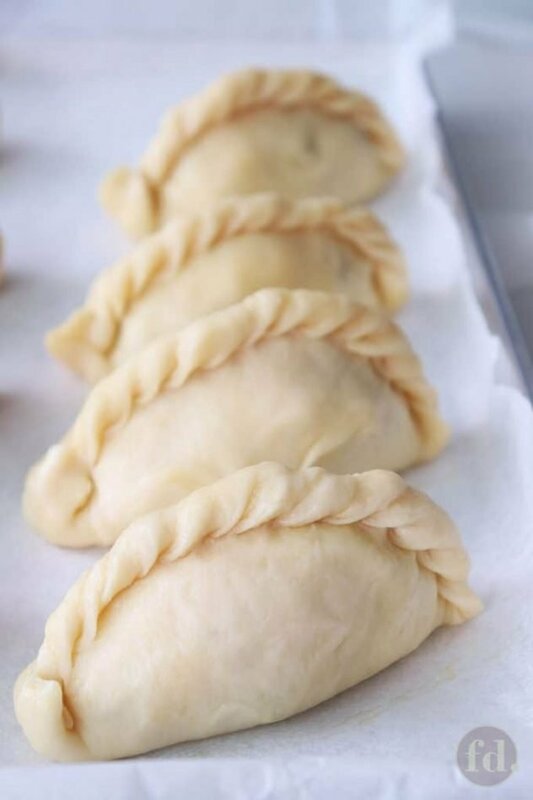 Alternatively, you may roll out the pastry, cut and stuff the curry puffs and freeze these ready-made puffs in well-sealed freezer bags. When ready to cook, remove from the freezer, no need to thaw. When frying frozen puffs, heat oil to 180°C (360°F), and maintain oil at this temperature for frying remaining frozen puffs. Hi Umairah, sorry for the late reply, I was having some issues on my site and comments were not coming through for some reason. It’s all good now. 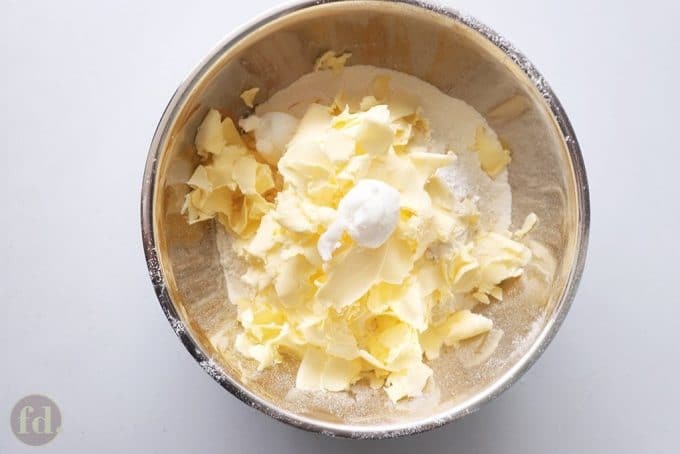 An acceptable substitute for shortening is often lard, or butter or margarine, but because butter and margarine both have higher water content than shortening, it may affect the outcome of the baked good, depending on what you’re baking. Just wondering any substitute for shortening? Hi Yasmin, I haven’t tried baking puffs made with this pastry, but it is essentially a shortcrust pastry, so I would think and hope that it turns out well too. If you do try baking it, could you share please? I’d love to know! Hi,I know you said frying the curry puffs are essential but I was thinking, if I were to bake it, would that work? Hi Rafiqa, I’m sorry but I’m not sure how to convert it accurately into cups, and it would not work for all the ingredients listed either, especially for very small quantities. In my humble opinion, the recipe in weights would yield more consistent and reliable results as well. I really want to try this! But can you convert the pastry dough ingredients to cups for me please ? Thank you so much for your kind comments and feedback, Pei Ling! Glad you enjoyed them!? Wow! Such detailed instructions in the recipe! Great work! Must have taken a lot of time to do this. The curry puffs are super tasty!